"This book is going to try and get as close as possible to the full story of what informed the noise of The Streets. Obviously that's something I should be fairly well qualified to know about, and I'm going to be as honest as the publisher's lawyers will allow." With the 2001 release of The Streets' debut single "Has It Come to This?" the landscape of British popular music changed forever. No longer did home-grown rappers have to anxiously defer to transatlantic influences. Mike Skinner's witty, self-deprecating sagas of late-night kebab shops and skunk-fuelled Playstation sessions showed how much you could achieve simply by speaking in your own voice. Mike skinner is a true artist! 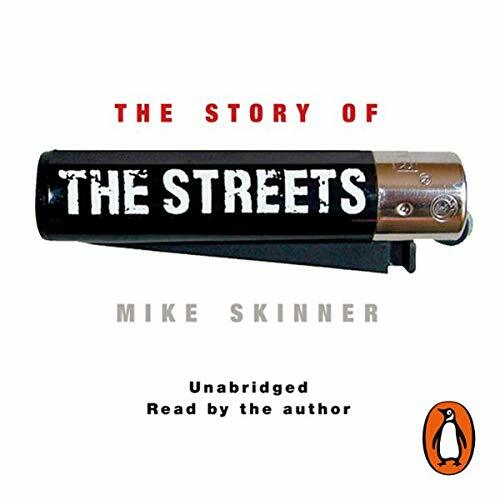 Definitely a great audio book in which Skinner speaks of his troubles and experiences throughout The Streets. No one sounds like Mike Skinner, and as his famous timbre begins, you do find yourself thinking, a 3 minute song is fine, but will I be able to stand a whole books worth of his monotone? And then you listen to what he's saying and you know that no-one else could read it. Every sentence about his music reminds you of the music itself, as his vocals *are* the streets. His words and the way he says them, that's what made me a fan in the first place. This is a brilliant insight into the UK music business, from a man who is intelligent, articulate, humble when necessary, interesting, and above all, incredibly normal, with a brilliant, objective view on life, served with a slice of acerbic wit. Brutally honest, compelling and refreshingly free from b******t.
It's been a privilege to hear the story behind the music that has meant so much to me over the years from the man himself. Far from being a fly-by-night 'geezer', Mike Skinner is a grafter, a craftsman and an unashamed control freak. Skinner's reading is, errrm, uncomfortable. It sounds like reading his book aloud is the last thing in the world he wants to be doing. But I get the impression he feels letting someone else narrate it instead would be an even worse option. I agree. If you're a fan of The Streets I can't see how you would fail to get more form the music after listening to the story. If you can overcome Skinners voice then it's a great story. I got to the end but it was a struggle. Mike is as open and honest as possible in this industry eye-opener. His brilliantly worded story gives you an insight into what was going on behind The Streets and their 5 priceless albums. And the music was already honest enough. I listened to this audiobook a few years ago and then re-listened yesterday and it was a dream to listen to Mike's voice again. Somehow all the drug taking that was going on doesn't seem so bad when written in such an eloquent way that Mike has done. The book does skimp on a lot of what I would decribe as inner detail, there is only so much you can fit into a publishers paper trail, but that I think is because there is to be a film made and a sound track to which he probably wants a few surprises. Big fan of Mike Skinner and The Streets. Loved this audio book. Probably would have enjoyed this more with a physical copy. Massive streets fan and it’s a well written book. Mike skinners dulcet tones aren’t ideally suited to reading an audio book though to say the least. Good book, buy the paperback though. I loved the streets and adore Mike Skinner. This book told me so many interesting things about the man and the music. It took me back to that time when he first came out and I had lots of warm and fuzzy memories of those days. This book thought me a lot about music and songwriting and was an all round joyful experience to listen to. informative amd emotional journey into the history of Mike Skinner''s world. uniquely wonderful and true.